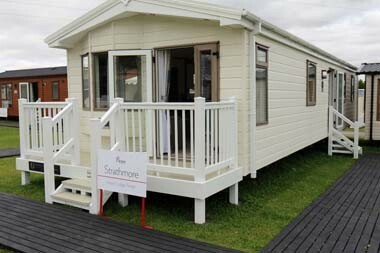 The Victory Strathmore leisure lodge is new in the company’s range for 2016. Fully double glazed and centrally heated it has an open plan living/dining/kitchen area with floor to ceiling windows and a patio door in the living area. 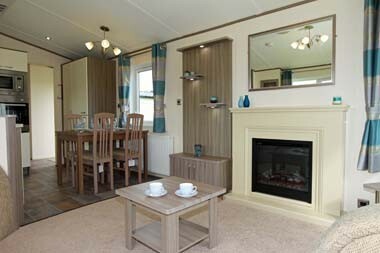 There’s a feature fireplace with a log-effect electric fire and a huge sofa for chill-out time, plus a wall unit with lighting and shelves and a television point are all well-placed for practicality. 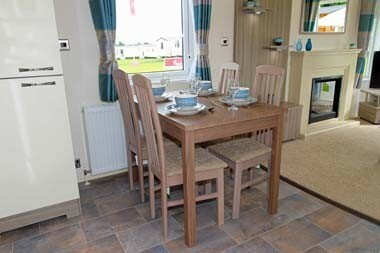 The dining area is opposite the kitchen and has a table placed by a radiator and underneath a window; definitely calls for a view! The colours are unusually subtle for a Victory Leisure lodge, being cool blues and grey with silver highlights; which was a nice surprise. 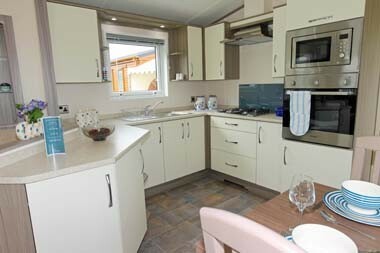 The kitchen is simple with good worktop space and sports a fridge freezer, microwave, burner gas hob with an externally vented extractor fan with a light, an oven and grill. Two double power points are above the work tops and there is a surprising amount of storage. But, you’ll need hands to do the dishes! A door leads to the hall where there is another power point and a door to outside as well as to the bedrooms and shower room. 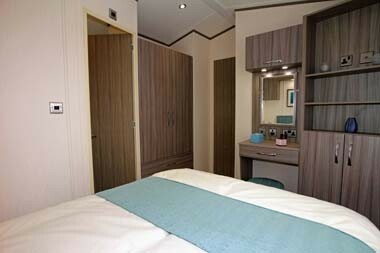 The master bedroom has a lift-up bed with a low level padded headboard with fixed bedside cabinets and over bed lights. Storage is thanks to a wardrobe with huge drawers and there’s a neat dressing table and upholstered stool. Power points seem to be in the usable places. 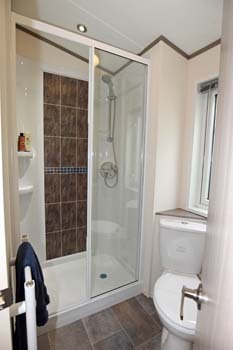 The en-suite shower room has a large rectangular shower tray with a sliding door and just to hold design focus, there’s a tile feature wall. The second bedroom has twin beds, in an unusual layout, but does have a wardrobe, coat hooks on the wall and cupboards; again there were power points in likely places. 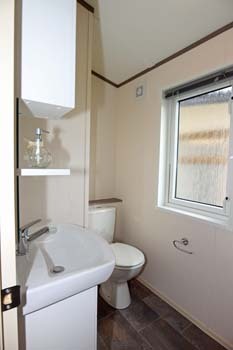 The second shower room isn’t dissimilar to the en-suite, in that the design theme is the same. The model we reviewed had high performance exterior cladding but other options are available, such as environmentally green or Canexel at a cost, and you can order window and gutter colour change to complement the cladding. I must admit to being a tad disappointed when I first walked into the Strathmore, but it grew on me as being suitable as a leisure lodge for the rental market and there are good yields to be made if you buy-to-invest. 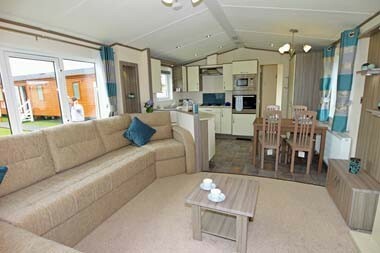 The bed linen pack is included in the price and there is a three-bedroom model available within the same footprint, but space is at a premium in that model. 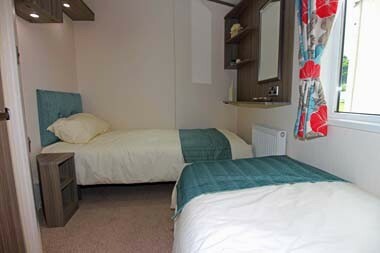 Berths: Up to 6, in two bedrooms (one twin and one double) plus two on an occasional pull-out bed in the lounge. Optional extras: Environmental exterior with colour co-ordinated uPVC windows and doors and choice of external claddings in various colours. *Additional charges will be made by park operators, and or distributors for the transportation and siting of your unit. Please check the price carefully before you commit to purchase as prices vary considerably dependent, amongst other things on the geographical location of your chosen park. I,m touring Australia at the moment and staying in some wonderful cabins and lodges. The layout is often simple and basic but stronger than our own style of the same. Could you learn by them ?